Is seamless, has no folds, and is thoroughly tested during manufacturing to ensure it is 100% waterproof against any type of leaks. Our shower pan liners are prefabricated with 7 inch structured walls (may vary within one eighth of an inch), which removes the necessity of including any type of backing between the shower wall studs. Compared to the traditional PVC liner this is a pre formed rectangular, square and neo angle shower pan liner. The translucent heavy duty polyethylene for easy drain location, made from recycled product made in Canada. We have put our OneLiner with the engineered slope system to make proper installation a snap, while still getting the proper slope for drainage. 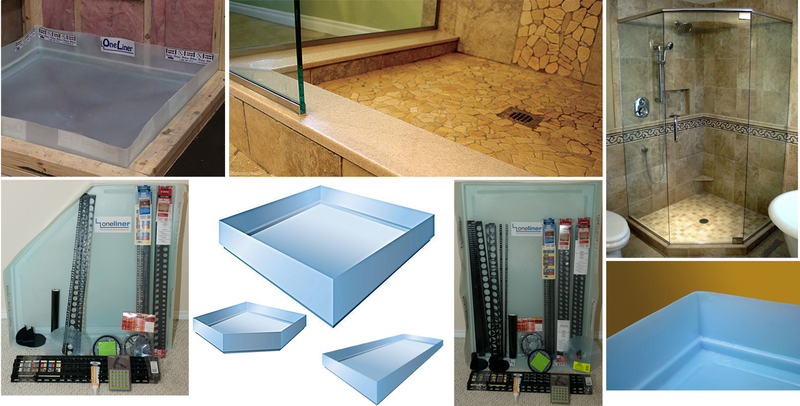 Easy reliable, quick waterproofing for your tile shower with mortar base.